(RT NEWS) India wants France to stick to the original terms of its deal to buy Rafale fighter jets, or it might call it off. If the manufacturers fail to comply, India may opt for the Russian designed Su-30 currently being produced domestically. France’s Dassault Aviation still has a chance to ink the huge $20 billion medium multi-role combat aircraft (MMRCA) contract to deliver 126 Rafale fighter jets to the Indian Air Force if the company complies with the contractor’s original demands, India’s Defense Minister Manohar Parrikar said on Monday. “Ultimately, it has to fit the RFP (request for proposal)… if it does not fit the RFP, nothing can be done,”said Minister Parrikar in an interview with the Headlines Today TV channel. The Rafale deal should be either finalized or ditched before Indian Prime Minister Narendra Modi visits France and Germany in April, Parrikar said, adding that India has invited representatives of Dassault to discuss the details of the deal. France’s Dassault Aviations won the MMRCA contract in 2012. The original conditions implied production of the initial 18 aircraft in France, with the remaining 108 to be manufactured at the state-owned Hindustan Aeronautics Ltd. (HAL) facility in India under a technology transfer agreement. The license for 108 aircraft to be produced in India supposed 74 Rafales would be rolled out in a single-seat version and 34 aircrafts would be twin-seat. But things have changed over the three years of negotiation, with the price tag rising from $12 billion to $20 billion. Also, so far Dassault has been reluctant to guarantee that HAL would have a license to build 108 fighters in India, as required by the original IAF tender and in the guidelines of the “Make in India” national policy. As the Rafale deal is dragging on, Parrikar said the Russian-designed Sukhoi Su-30MKI fighter jet that have been produced in India since early 2000 offer a viable alternative. “The Sukhoi 30 choice is always there. What I mean to say is: upgrade the Sukhoi 30, make it more capable,” said India’s Defense Minister Manohar Parrikar. 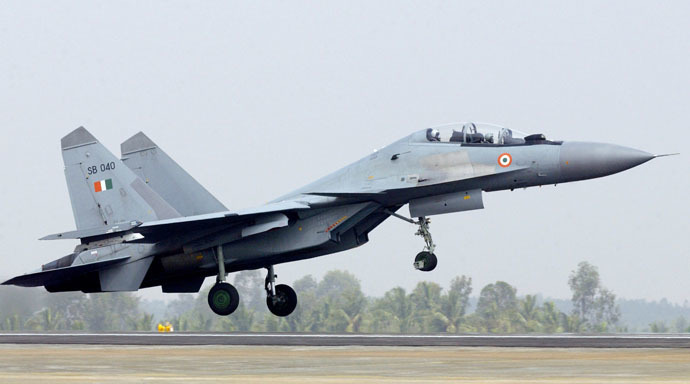 The Su-30MKI fighter was specially developed for India by Russia’s Sukhoi Design Bureau and 200 aircraft has already entered IAF service as of August 2014. The minister also made it clear that the IAF is concerned with the fighter costs. “It is not always… go and purchase it. A cost effective purchase is also important,” he said. The average cost of a Sukhoi Su-30MKI fighter jet is approximately $56 million, whereas France’s Rafale fighter varies from €64 million to €90 million ($75-$106 million).